1. My website, cloudatlas.com, was hacked by Russians and blacklisted by Google. 2. 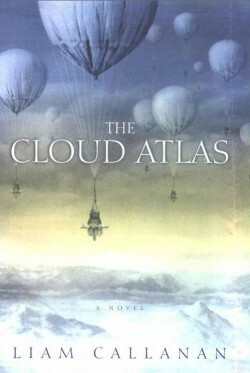 My novel, The Cloud Atlas, zoomed to a triple-digit Amazon ranking without my having to email — as I did back when my novel was first published — a single parent, aunt, cousin, neighbor, classmate, ex-girlfriend, former teacher or current student and beg them to buy the book instead of “waiting until the library gets a copy,” as a friend promised he would. 3. Instead, I get a lot of email, from loads more readers than I used to. 4. Including one at 12:14 a.m. this week from someone who had accidentally checked my book out of the library, and was still reading it. 5. Many people write to say that they liked my novel better, and not just because I tacked a definite article on the front of the title. 6. Other people write to say they like Cloud Atlas better, which kills me because I knew I should have cut that The, but it looked so pretty. 7. A lot of people are posting Amazon reviews for the wrong book, except for the elderly guy who, a long time ago, gave my book one star — because, he wrote me, #1 means best and your book is, and which has tanked my ratings ever since. 8. Other people write to ask why the book doesn’t match the movie. 9. I find myself having to explain that even though I, unlike David Mitchell, never considered my novel “unfilmable,” no one ever bought the rights to my novel, although there was an exciting phone call with a Hollywood agent who said he loved the book but — Listen Liam, snow is expensive. It would help you to know, I suppose, that my book is set in Bethel, Alaska. It would also help, if you were trying to acquire film rights for my book to have read the book, wherein you’d discover that there’s no snow in it, because it takes place in Alaska in the summer. But Liam, it’s Alaska, so people are going to think snow, want snow, and snow isn’t cheap, you’ve gotta shred diapers and usually in London. 10. I find myself musing about how I not only had the title first (by a few months, at least in the US, and no, you can’t copyright titles but another thing I was totally in on before everyone else — at least before Taco Bell discovered it — was Bethel, Alaska, where I was interviewed by the bilingual English-Yupik public radio station that gave Corey Flinthoff his start. 12. I remember walking out of her library with fistfuls of cash, because that’s where we did the reading and sold books for $20 even, cash on the barrel, and I think there was a barrel, and I was happy to sell out because I’d had to bring them in my luggage all the way from Washington, DC. 13. I recall how, as little as a few weeks ago, my novel, written after [insert standard debut novelist years-of-toil story here, though mine includes a bad-luck lava rock repatriated to Hawaii with a $20 bill and this guy’s help, which totally works, people, see 1–24], sold, gently used, for a single penny on Amazon, less than you’d pay for a stale gumball from the Lion’s Club at the supermarket, and now costs $11.15 used (paper) or $162.09 “new” (hardcover, and sold by the aptly-named Amazon bookseller, “yourdollarstretcher” in Connecticut) — or $10.20 (paperback and truly new) from Random House (via Amazon), which is the only way I make royalties, which is a bummer, because Amazon’s estimated shipdate now fluctuates from days to weeks to months, by which time people will have moved on, unless they’re watching the movie, which I understand takes a while. 14. I spend a very short amount of time each day wondering how much David Mitchell got for the film rights and wonder if I’d use the money to put my kids through college or to put them to work at the bookstore in Paris they wanted me to buy. 15. I remind myself that no one’s really in this for the money, not even the Russian hackers. 16. I think about how no one offered to buy cloudatlas.com, not even the Russian hackers. 19. I’ve seen it once. 20. Otherwise, I spend my time making lists of things. 21. That might have been. 22. And then I go buy a ticket to the movie already. 23. And maybe his book. 24. And maybe, if I can scratch up the dough, a copy of mine for him.